Big Judo keep their eyes on what is happening on the web. Big Judo's friend Stu Mitchell has also kicked off a nice Brazillian Jiu Jitsu (BJJ) Blog. His address is http://www.aucklandbjj.com/. 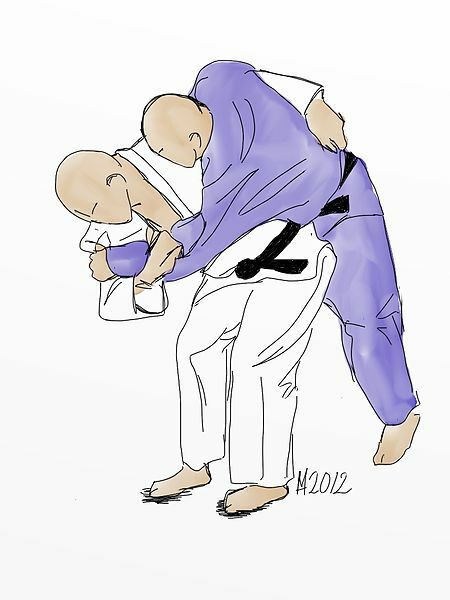 Stu's blog is interesting because as well as being a black belt in BJJ he is also becoming a pretty useful Judo player and his insights into the two styles are pretty interesting. At Big, we are equal opportunity martial artists. Judo is our lineage but we are always keen to mingle and mix it up with other styles -its the way martial artists get better and the way that new more effective technique evolves. If you get a chance have a look at Stu's blog his perspective is pretty interesting. The team from Big Judo and University Judo Club have been helping out with re-establishing an Auckland Police Judo Club. Many years ago, when I was a teenager, the Auckland Police had a strong Judo club based in the Central City. It was a great place to train and ties in with a strong international tradition of Police Judo. Some of the most renowned clubs in Japan are Police dojos. With help from University and Big the Police are getting a new club going. Tonight Jordan was there supporting training and all accounts it was good night. We wish the Police luck, will continue to support their programme and should have some photos soon. Big Judo has set the date for launching it's new Judo Classes in Pukekohe. On 2 August 2013 we will be starting a Junior Class and a Senior Class. The aim is to develop a number of classes over time. In the dim and distant past Pukekohe had a really strong Judo Club that peaked at more than 200 members. Some pretty fierce fighters started their careers in Pukekohe including the Stormont sisters, one of whom Rochelle, represented New Zealand at the 2004 Athens Olympics and Neil Swailes. Neil is one of New Zealand's most successful MMA exponents and is well respected fighter, trainer and promoter. So if you live in Pukekohe or nearby and would like to train with us give Ben a call on 021 688 289 or Geoff on 027 473 6720. Now that we have split the Central Kids Classes we are going to really start uping the technical levels in their training. To help out and to provide reference material we will be uploading our own videos and few that the team at Big like from You Tube. So keep an eye on this space!